When my daughter was in preschool, one of the moms (who happened to be a science ed specialist) did a project with the whole class. It was brilliant. She taught the kids how to work a catapult (made with a plastic spoon, I think) and, over two years later, my kid still talks about that day. So, I was not too surprised when the girl said recently: "I want to make a catapult!" A quick Google search turned up instructions for one made out of craft sticks and tape. Now that is my kind of project. Historically I've not been too handy with 3-dimensional construction, but I'm up for anything that requires tape! We started by making three congruent triangles and followed the directions through the next step. Suddenly, recognition! "Hey look at what we've made!" I exclaimed. "It's a...?" Not surprising -- triangles are the strongest shape, and it was fascinating to see how strong they really were, even given the modest construction materials. We used a simple origami box we had lying around as the catapult cup, and wondered if a wider arm would fling objects further. We love our new catapult and have had many hours of enjoyment flinging unifix cubes around the living room. Now that is math in action, lol! Nic Gareiss at Dance is Music continues to be my source for all manner of percussive dance inspiration! Despite all my more recognizable math postings lately, and my never-ending enjoyment of accompanying my 6yo on her math journey, this kind of dance (not tap dance, actually, but related forms) is really where my interest in math all started. Over time, performing and, especially, teaching percussive dance made me wonder if there was math in what I did. I simply asked the question and now kids get to learn math topics and exhibit their mathematical thinking and choreographic prowess through their bodies and foot-based dance patterns. Here's the whole story, if you're interested. After posting Knowing Numbers & UNO Update yesterday there has been a development around subtraction, the addition of division (word play intended), an observation about the thinking-backward mind, and the arrival of the perfect book at the perfect time. Today, the kid asked for another math test on the drive home from the Columbus Children's Museum. I gave her equations: 18+2, 16+4, 13+7, 10+10. "Hey, those are a lot of different ways to make twenty!" she exclaimed. "How many more ways can you think to make twenty?" I asked, thinking only of additional sets of addition. Here's what she came up with: 22-2. We stopped to get gas. We went into the service station with me quizzing her: "Twenty take away one is... twenty take away two is..." and came back to the car having easily figured out the pattern all the way to zero. I think that all of this has been made possible because her brain spontaneously clicked into counting backward a couple weeks ago. I am triply convinced that this is a brain development phenomena because earlier this week she wrote five sentences 100% in reverse (right to left sentences and words plus all letters written backward). I had never seen backward writing like this from her of this magnitude. And, just tonight, she was working on singing the alphabet song backward. This is not a coincidence. A supportive learning environment is key, but sometimes you just have to be patient for the brain to be ready. Back in the van she asked, "Do you think I'm ready for the next level?" "Sure," I said, with mind racing to figure out what the next level was, "What's 33 take away four?" Done. "Do you want a puzzle to solve?" I asked, thinking of something Raising a Happy Child had written in comments to yesterday's post. We'd been doing multiplication using visual groupings, why not invert the process? Voila! The kid's first introduction to division. "You and three friends have 20 candies. If you share them equally, how many candies will each of them get? You can use pictures like we do when we play Star Count, you know, make circles and put in the dots." She started easily, but it took a little work. No matter, we've got mental and visual math firmly in place now, and she is so proud of herself. I think she likes the feeling of a good challenge -- solving a puzzle that's hard enough, but not overwhelming. That's right, Young Children Continue to Reinvent Arithmetic, Implications of Piaget's Theory by Constance Kamii. I am on some strange yet wonderful journey of discovery. What's next?! I've been watching my six-year-old daughter explore math all fall and now into the winter. At the same time, I have also been reading books about how K-2 kids learn math, and growing my own 'math eyes' (as Maria Drukova of Moebius Noodles and Natural Math says). It's been fascinating to watch my kid's understanding of numbers develop over the last six months, even with a somewhat hands-off approach. She started this summer with a lot of comparing and measuring. Then she started asking lots of questions about numbers and shapes, mostly on her own time. Sometimes I'd be there during the process, as in this line of questioning about dividing a number in half. Other times I'd run across the results of her thinking later in the day, as with a geometric study she initiated with some tangrams. There's a book I've been reading, a few pages in bed each night before I turn off the light. It's called Games for Math: Playful Ways to Help Your Child Learn Math from Kindergarten to Third Grade, written by Peggy Kaye. In this book, Peggy shares all sorts of fun math games that require no more than some paper, a pencil, some dice to roll, tape, egg cartons, beans...you get the picture. The best thing about this book, besides the very easy-to-implement, high-interest games is how she puts the games into context with stories about working with specific children. I really, really like 'hearing' her have math conversations with children; the activities are pretty simple but the important thing is how she models mathematical reasoning and problem solving strategies while she plays the games with each child. My favorite games so far are Star Count and Lots of Boxes. Both involve a pen, some paper, and a die to roll and both focus on understanding groupings of numbers as a way of practicing counting and introducing multiplication at the same time. My kid has been asking questions that show she is thinking multiplicitively, but she is not quite ready for or interested in sitting down to discover the patterns in the multiplication chart, so these games are perfect for her right now. Also, How Many Boxes is also a great introduction to perimeter and area since it is played on graph paper. My kid has been spontaneously skip counting since the early summer, and counting forward for longer than that. In terms of the girl's new penchant for counting backward, it seems this new skill of hers is really important for mastering subtraction, something we haven't done a lot of. Ha! It's probably the largest UNO score EVER!! And, it's a great way to introduce hundreds, thousands and millions as well as 'which number is biggest' on the grandest possible scale. The cards become great manipulatives, so once she gets comfortable reading the numbers I've made (while modeling my thinking process), she'll get a chance to figure out how to move them around to make 'the biggest number' she can. But back to counting backwards. I don't really understand my child. She is quite independent in her learning, and often resistant to formal instruction. But she really likes it when I give her spelling tests!? And, today, when we were at the library, she asked me to give her a math test. Um, okay. I eventually obliged and put together a list of equations. As I've said, we haven't done much in the way of subtraction, so this little test was actually a good way to assess where she is right now. Plus, with my new understanding of counting backwards? Wouldn't you know it -- there she was counting backward to figure out the answers! She also wanted some multiplication problems so I used a strategy from Peggy Kaye's Star Count game to illustrate each problem. "Two groups of two", "three groups of four", "five groups of one" are the way we say it. She got her answers by counting the dots, but I can imagine if she keeps this up we might be ready for coloring in the patterns in the multiplication chart by spring. I really want to do square and triangular numbers with her using visuals but, as always, I just need to be prepared to jump in with it when there's an opening. In closing, as I was in the process of wrapping up this post, the kid wanted another math test. I learned a lot from seeing how she answered the questions. Next time I'll put the addition, subtraction and multiplication problems in their own sections, not all mixed together. But the biggest thing is that I'm going to get the Cuisenaire rods out again so we can solve the subtraction problems together for a while. 30-2 was just a little too big of a 'problem' for her, but if we can look at it with the rods I think the idea will click into place without much fuss. My final lesson? Math is definitely a morning thing. No more math at 5pm! The design incorporates lots of little triangles, but the end result is pretty square. 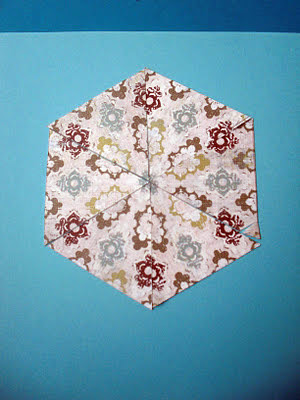 Not that there's anything wrong with that, but wouldn't it be cool if a beginner paper quilter could create something more circular using triangles? 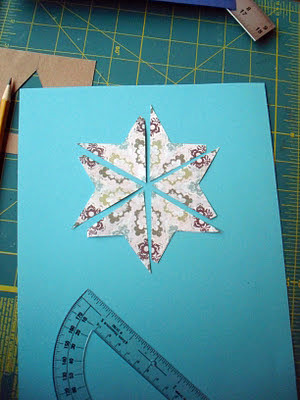 In her snowflake book, Paula Nadelstern shows how to design snowflakes using a "60˚ triangle" unit. She doesn't say equilateral, but I think that's what she means. 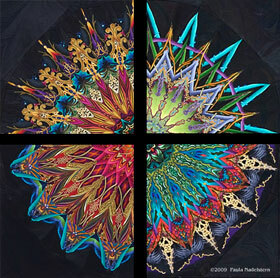 I read through her book and tried to get the gist of how she makes these beautiful fabric images; it appears the whole thing revolves around one single, accurate triangle template. Not good! Seems to be missing a few degrees. So, I tried again. In her book, Paula gives a formula that was helpful for constructing an accurate triangle. The smallest one had a vertical length along the center axis of 2 3/8" and a horizontal length, to both the right and the left of the center axis of 1 3/8". It worked! Here's a picture of how I marked it out. 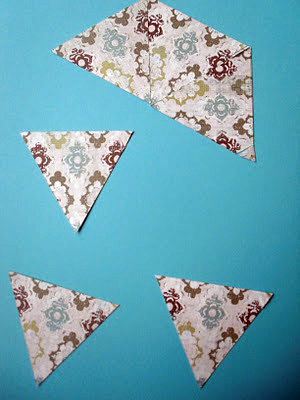 I cut out the triangle template using an exacto knife. I made the template out of cardstock because it was all I had on hand. I made it what I'll call the 'reverse' of a traditional-type template so I could easily see where I was putting the triangle on the patterned paper. 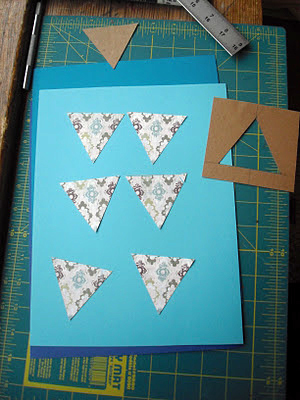 As you can see, below, I was pretty successful at getting the same part of the repeating design in the same place on each triangle using this 'see through' template. Yay! I thought it looked really good at this point, but I wanted to see if I could give it just a little more shape. What I noticed in Paula's designs is that the snowflakes get their form by focusing the design at the edges where the triangles meet; one edge has half the design, the adjacent edge has the reflection. Focusing on the 'spokes' (for lack of a better term) that are created where the edges meet (and create lines that radiate out of the center of the hexagon and through each vertex) ultimately creates the snowflake's design. I think! I had just enough time to try a small experiment to see if I could highlight the 'spoke' portion of the hexagon. After making a couple more measurements and lines I cut a new template out of the leftover 'insides' of the triangle template. I think the final design looks more like a flower or a star, but I'm still pretty pleased. I think I'll try stripes next time and see what happens! While I was in the process of cutting out and placing triangles, my daughter got really excited about the intermediate shapes I was creating. 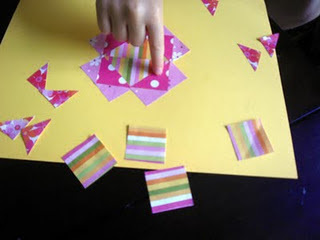 For the K- 2 set I think a great start to the project would be to give them some patterned paper triangles and some glue sticks and let them explore what kinds of designs they can make, observe others' work, and help them find ways to describe what they see. Later, you could bring in some inspiring hexagonal designs (both your own and others') to serve as models for the rotational design element. Once you spend some time deconstructing the examples it would be time to give the kids more materials and start the design/observation/reflection process all over again. I believe that, even with the younger elementary kids, the experience of putting six duplicate, congruently patterned triangles together to make a hexagon has the potential to reveal the complexity of this shape in a new and inspiring way. I, for one, am seeing hexagons in a whole new light. Finally, to make this a viable project for multiple children I really need to find a easier way to prep a large amount of paper triangles. Does anyone out there know what kind of cutting tool might be able to do this? I'm planning to play around with this some more, so stay tuned! Inspiration can strike at any moment. Even mundane moments like flying in and out of the library to pick up a book on hold and then running home to make dinner. 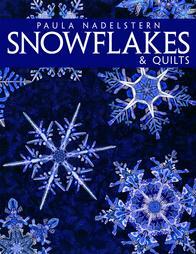 These are quilted snowflakes. Snowflakes are hexagonal don't you know and just LOOK at these beauties. 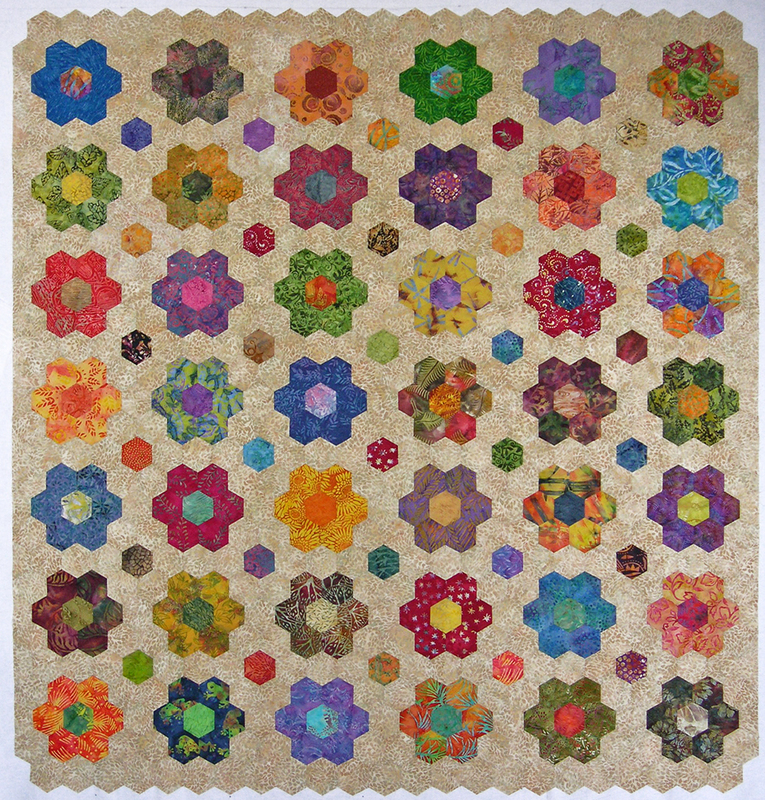 I've always thought of a hexagon as a bit cumbersome, but these take my breath away. I snatched up the book and devoured it. 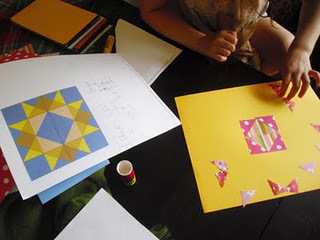 I have no intention of quilting anything, but I am handy with paper and I think that somewhere within all this complexity is a (much simpler) project for younger kids, and possibly a fun construction challenge for older ones. 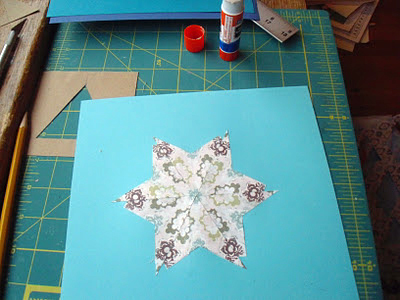 In my next post I'll share my first attempts (one failure and one more successful) at finding bilateral symmetry within a paper/fabric print and using it to create the rotational symmetry of something resembling a snowflake, or a star, or...err, well it looked nice, whatever you want to call it. 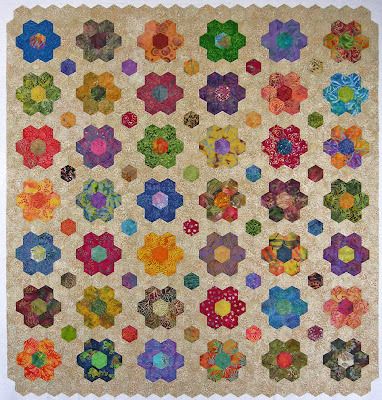 Until the next post when I share my modest efforts, here's a quick peek at the glorious visions of Paula Nadelstern's kaleidoscope quilts. Blog Carnival over at Let's Play Math! Hey y'all, I've been included in the "Math Teachers at Play" blog carnival over at Let's Play Math! This particular carnival features "a smorgasbord of ideas for learning, teaching, and playing around with math from preschool to pre-college" and is illustrated with some great examples of living math books. I'm pretty excited to be included in my first math blog carnival but least you think I have my math act all together, let me assure you this is one big adventure I'm on. My blog has been, and continues to be, a vehicle for me to figure out for myself what math is. I've got a pretty firm grasp on the math we use in my program Math in Your Feet, but I'm a big picture person and I've always wanted to find a way to put our dance work firmly in context on the mathematics map. I am also perpetually curious about how people teach math at an elementary level. Luckily I've got a six year old daughter along for the ride. I use her interests to frame my inquiry and, by working at the pace of a first grader, I am much less intimidated about re-learning math than I might be otherwise. Working with my daughter has actually been, to use a new math term I've recently learned, a kind of recursive, looping process. She shows me, through her drawings, and conversations, and number play, how she is thinking and then I go find great resources like Let's Play Math, or Living Math, or Natural Math, or Love2Learn2Day, and see if I can figure out how to support and deepen her questioning. In the process of finding a new math game or book for the kid I also find some new bit of information for myself about a math topic or an instructional approach or theory. I spend part of my days with kid math and my nights reading everything I can get my hands on, from research studies about cognition in mathematics to books about archetypal relationships between mathematics, arts, science and nature. Then I'll go to bed only to wake up to hear what my daughter's got going around her head, and the process cycles around again. I hope you will take some time to check out the Math Teachers at Play blog carnival! If you are interested in doing and making more math with your own children or students it's really just as simple as finding an interesting math-y story book or game and going on from there. My biggest lesson in the last year or so is that I don't have to know everything, I just need to keep asking questions! That's really all there is to it. Have fun! After constructing all the Platonic solids out of straws and pipe cleaners (some with my daughter's help) our favorite platonic solid is hands-down the icosahedron. I made this one with one green pentagon end, and one yellow pentagon end. It 's strong and sturdy, spins well, like a top, and is fascinating to look at from every angle! Yup! Looks like a family, to me (Papa solid, Mama solid, sister solids, baby solid, lol)! 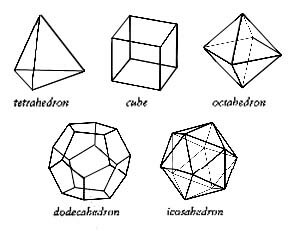 But, clearly, the icosahedron, despite more faces and the same number of edges, is smaller than the dodecahedron. For what it's worth, I guess I have my answer about the scale issue. We've been exploring platonic solids around our house lately. We've made them using toothpicks and marshmallows. We've made them with straws and pipe cleaners. We're even in the process of building a house using straw and pipe cleaner cubes as the building blocks. Both myself and the kid are learning a lot through the making process, but also from the the fact that we've filled our living environment with the structures. Because they're so open, there are all sorts of relationships within the solids themselves that we observe by simply walking through a room on the way to somewhere else. This is one more great example of environment being an effective teaching and learning tool. The kid is definitely interested in all this, but me? I have to say that I'm a bit obsessed. Questions keep coming up, and they are loud ones that are demanding answers. Luckily, an office supply store near us had bags of 100 brightly colored straws on sale for $1.00 a bag, so we've got enough supplies to go on for a while. And here it is compared to three other platonic solids: a cube, a tetrahedron, and an octahedron, also made with 6" straws and some pipe cleaners. Wowsa. Not only is the dodecahedron much bigger, it's also really obvious that its not strong enough (using these materials) to hold its shape. Interesting! Remember, three of the solids shown are made with six inch edges and the dodecahedron is made with three inch edges. I never would have observed this if I hadn't built a 3D model. Score another point for hands-on learning! I wonder what will happen when I try the last platonic solid, the icosahedron? Even though it has eight more faces than the dodecahedron the faces are triangles. I'm thinking that even with using 6" straws the end result won't be as cumbersome. Wish me luck! We are going to build a cottage. That we can live in. We are building it out of straws and pipe cleaners. We started with one cube and attached another to it. You should have seen the kid's jaw drop -- it was like magic. And, did you know that after the first cube you don't need to make a complete cube ever again? I quickly figured out my methods, but it was hard for my six year old to keep up with the precision. To attach the straws use half a pipe cleaner folded at each end, then bend it into a 90 degree angle and slide the straws on. Unless of course you are attaching your cubes together. In that case you make one folded end for the open straw, and slide an unfolded end into the attachment point. But that's just what I discovered and, honestly, half the fun was in trying to figure it out! I suspect there are a lot of right ways to go about doing something like this. If you decide to try building like this I'd love to see pictures of what you make! In the end, the kid and I worked as a team for a while and then she left to rehearse her show which opens with the song "The Moral of the Soggy Hat" (an original number). I imagine this building activity continuing mostly on mama power, but that's because I have ulterior motives. I get to do a ten-day version of Math in Your Feet this summer for some inner-city programs for kids ages 6-12﻿. In addition to rhythm and pattern in the feet and hands, we'll be exploring what else you can do with a pattern unit, which includes building! I can imagine, over two weeks, the older kids will have built something really cool. And if they get really good at it, I might suggest trying to construct something out of tetrahedral units just for fun! But I think I should try it out first, just to get a sense of what the pitfalls might be. As for my girl? She's all for building something she can live in, even if it's made from drinking straws. "But Mama," she said, "Will I have any privacy?" I'm trying to brush her hair. We've got places to go, people to see. She darts over to the straw/pipe cleaner tetrahedron and brings it back to me. "This tetrahedron does NOT have equal sides." "Well...[positioning the tetrahedron so that one triangular face is toward her, and pointing through to show the two other triangular faces coming together in the back]...you see these sides are two together, but this one...[losing steam]"
"Those sides are called faces. I think what you're showing me is that there are two faces that look like they're opposite each other, and that there's a third in front that has no match?" "Here, look. Let's count the number of faces of each solid you made with marshmallows and toothpicks... [counting together, four...six...eight] It doesn't matter how many faces there are, just that they're all the same. Hey! I know, wanna try making an octahedron out of straws to go with our tetrahedron and this cube? "Let's make a model of the Parthenon out of straws and pipe cleaners!" "Uh, okay...maybe we should finish building these solids first? So then we'd have some building blocks to work with?" "It'll be math and history at the same time!! That'll be really fun!!" "You're absolutely right! [rummaging] Hey, here's that book I got at the library book sale, on buildings of the ancient world. Wanna see? Here's the Parthenon." [Kid, looking at the book, flipping through the pages.] "Or we could build a castle. But what would we do for the round towers?" Never did get her hair brushed. Didn't really get to building the Parthenon either, but we did build the octahedron and get out the door, eventually. This is the first time we've tried making structures with straws and pipe cleaners. The beauty of platonic solids made with a unit length of 6" or so is that because they're not really, well, 'solid', you easily look through them to the other side which is what prompted the whole exchange, above. You can also play around with them more easily, experimenting with how they fit together and observing how the relate to each other. Just as exciting is having them around the house with us, keeping us company. We've been admiring the toothpick/marshmallow sculptures and solids from last week as well. After making all these wonderful structures, it's also been wonderful to share our space with, well, space. And, I am reminded over and over, that just because I look at something doesn't mean I understand it. Even for me, as an adult, physically constructing these solids is bringing to light a whole new understanding of structure, relation and order. As always, this is an amazing (and fun!) learning journey for both of myself and my daughter. Given my daughter's resistance to formal lessons, it really was the perfect storm. A supervised math activity of new concepts thinly disguised as 'something to do while mama makes dinner'? Yes, please! It came about as a sort of semi-premeditated accident: It was time to get dinner ready and there was a lot of prep work to it. I had the mini-marshmallows and toothpicks at the ready, as well as buy-in from the kid who had seen this post of the amazing, huge, Serpinski-esqe giant tetrahedron built by the kids at Almost Unschoolers the day before. I laid out some newspapers on the kitchen floor and poured the marshmallows into one bowl, the toothpicks into another. Completely off the cuff I said, "Here's how you can make a square base, and then build up from there." I built about one half of a cube and then said, "I really want to make tetrahedrons, but I don't have time now. See what you can do." The kid jumped in enthusiastically. She started by making one cube, no problem. She added on another cube, then two more to make a four-cube base. She built it up a level, and up a level again. "I'm an artist! I'm making a sculpture! Let's put these piece under glass, like in a museum. It's marshmallow art." Despite this enthusiastic chatter she was actually a little worried that the kids at Almost Unschoolers would be mad at her for copying their work. This led to some conversation about copying vs. learning the basics so you have the skills to express your own personal vision, and then, thankfully, our attention was diverted. The tower/sculpture of cube units started to lean. These marshmallows are tricky! The kids at Almost Unschoolers made it look easy, but it's not! There are all sorts of structural problem solving challenges to overcome. I suggested turning her 'sculpture' on its side (pictured below) so it would be a little more sturdy. We counted how many cube units made the structure. It has an interesting twisting quality to it and is my personal favorite of all her 'marshmallow art' pieces. She worked on another sculpture and then...lo! The girl created a tetrahedron of her own, then played around and discovered, on her own, how to create an octahedron! The picture below shows all of today's creations. The 'sculptures' which she created first, are in the back row. The geometric/platonic solids, created at the end, are in the front. What's interesting to me, in terms of my daughter's learning process, is that it is more apparent than ever that she really wants to explore and discover new things on her own first and then, when she's had her fill, she comes more easily and willingly toward 'the point' of the lesson. Whatever you call this afternoon's explorations it was a fun, full hour of inquiry. 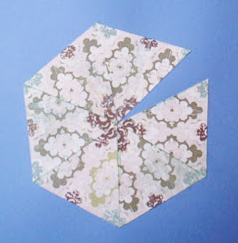 It was also the first time, except for origami, that I've willingly pushed us into 3D math. I'm learning right along with her, and it's an amazing journey.